Abalone Swirl “celluloid” scales (IMP19PRS). 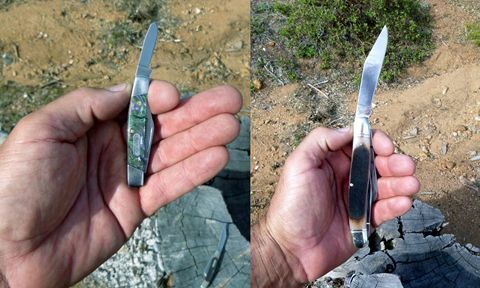 When it comes to traditional “slip joint” pocket knives, it’s difficult to say whether the Trapper pattern (discussed in the March issue of this newsletter) or the Stockman is the more popular. To help tell the Stockman story I will once again use examples from the Schrade lineup. As I mentioned in the Trapper story, all Schrade pocket knives, since the original USA company went out of business in 2004, are today made in China. Let me present four options from three Schrade brands; Old timer, Uncle Henry, and Imperial. 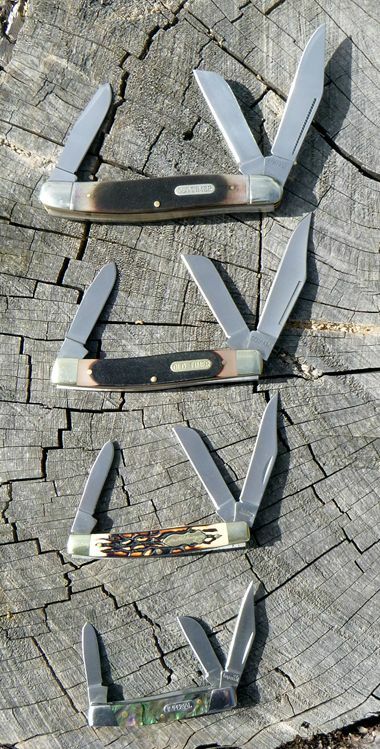 The classic Stockman pocket knife pattern normally has three blades. The largest, or “master” blade is a clip point. The master blade is accompanied by two smaller blades, a spey point and a sheepsfoot. The clip point blade is also thicker than the other two. In the Trapper, both blades are equal in size, so the concept of master blade doesn’t apply. If you grew up with Swiss Army knives as your most familiar type of pocket knife, like me, you may wonder about the wisdom of including three different types of blades, but no other tools such as screwdrivers, corkscrews, awls, etc. Well, classic American pocket knives were seen as just that – knives. They were never meant to be a sort of pocket multi-tool. But the different shapes of blades were meant to provide the optimum cutting tool for any situation. As a bonus, if you dulled one blade in use, you could pull out another until you were able to get back to the sharpening stone. The Stockman is one of the best tools for that old-fashioned pastime of whittling. The three different blade types give you options to be able to carve the various features in your whittling project. For example, when I carved that MRE spoon out of a pine branch, the large clip point blade or the sheepsfoot would have been good tools for the initial shaping job. But the medium to small spey blade would have been the best tool for carving the bowl of the spoon. The biggest disadvantage of these old fashioned jack knives is that the blades are held open only by the tension of the backsprings. You’ve got to be very careful not to put too much force into the point of the blade. The clip blade has a very sharp point on it which makes it a great stabbing tool. But placing too much stabbing force on it could cause it to fold closed on your fingers. Ouch! My collection of Stockman pattern knives began with the smallest one, the Imperial 19PRS. I received it by mistake when I was trying to order a medium Trapper from the Imperial line. You can see that this thing is really tiny. Because of that, of all the sizes, it will be the most comfortable in your pocket. It will slice open the tape on shipping boxes, but its uses beyond that will be limited. It’s really too small to be able to get a secure grip in a man’s hand when any force must be applied. I’d like to mention something about those handle scales. In many descriptions, you will see these listed as “celluloid” handles. Celluloid is considered the first thermoplastic and found use in the early 20th century for pocket knife handles among many other uses. It was a lustrous and beautiful material for this purpose. It was also used in the olden days for movie film. Celluloid has a problem though. It is made out of the same stuff as gunpowder – nitrocellulose. It’s highly flammable. I think we’ve all seen depictions of people sitting in a theatre, watching a movie, when all of a sudden, the screen shows the movie melting away and catching on fire. That happened a lot in the early days of film due to the hot bulb in close proximity to the celluloid movie film. Knives catching fire was never a problem, but over the years, celluloid will degrade, releasing acidic gases, which of course is no good for blade steel. Today’s “celluloid” knife handles actually use a modern thermoplastic that does not have celluloid’s problems. Due to historic reasons, many will still refer to these plastic handles as celluloid, though it’s really a different material today. Taylor Brands, today’s Schrade company, mentions that these handles are made of POM, a modern engineering thermoplastic. The Imperial line has three sizes of Stockman knives. They all share in common the “celluloid” handles and use a low carbon Chinese stainless steel, 3Cr13MoV. Because of this, the Imperials are quite affordable. In the next size up I have an Uncle Henry Rancher, model 834UH. This may be my favorite size Stockman for a true “pocket” knife. It has blades big enough to be useful for most purposes, a handle big enough for a secure hold in the hand, but it is still small enough to be comfortable when dropped into your front pants pocket. Most Uncle Henrys have Schrade’s so-called “Staglon” handles. Basically that’s plastic molded and colored to look like deer antler, or stag handles. 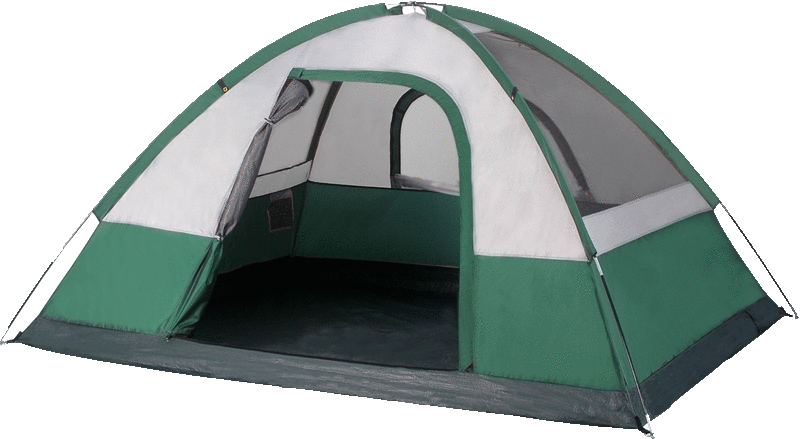 The Rancher uses a mid-level, but still affordable Chinese steel, 7Cr17. Though the standalone Amazon price for this knife is about $20, I bought this knife as part of a 3-knife gift tin package on clearance at Sportsman’s Warehouse. The marked-down price of the three knives together in the tin was about $17. I couldn’t pass up a deal like that. Next up in size is the Old Timer 8OT Senior Stockman. At almost 4 inches in length, this knife might be too big for your front pants pocket if your jeans are on the tight side. If you are a fan of Tru-Spec 24/7 pants, those have two handy-dandy knife pockets, one on each side. The 8OT rides very comfortably in the 24/7 knife pockets. You won’t notice it until you need it. The 8OT is a longtime favorite of classic pocket knife collectors. It was the second knife introduced under the Old Timer brand back in 1960 or 1961. The 8OT features “sawcut” Delrin (a type of plastic) handles. Sawcut means that the handles have a series of very fine grooves cut in the surface which provides a very nice non-slip hold. When I learned that there was an even larger Stockman than the 8OT, I had to add an example to my collection. The aptly named Lumberjack is probably too big to be considered a pocket knife. It’s really big enough to beg for carry in a belt sheath, though it does not come with one. There are two versions of the Lumberjack. One has the sawcut Delrin handles like my 8OT. The other version, model number 858OTB, is made with genuine bone handles (the B means bone). The bone handles are also sawcut with the fine grooves, and at first glance, appear no different than the plastic handles. The three larger sizes of Stockman pattern knives are represented in the Old Timer bone handle series. These are deluxe versions of the standards. They are made with an upgraded steel, 9Cr18MoV, polished to a mirror finish. The bolsters have a decorative groove that the standard versions don’t share. Plus the nail nicks include decorative “match strike” grooving that the standard versions also don’t have. The Old Timer genuine bone series knives are very classy pocket knives. The good news is that they really aren’t much more expensive, if at all, compared to the plastic handled equivalents, surprisingly. Maybe because I am now approaching Old Timer status myself, I’m starting to appreciate these fine classics.